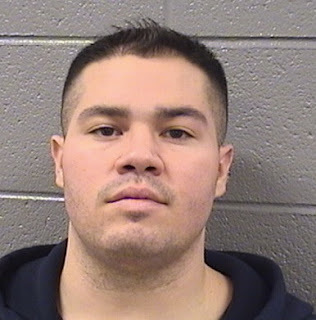 A 27-year-old man has been charged with firing a handgun on the roof of his Lincoln Park apartment building last weekend, a stunt that drew police resources from five districts after first responders feared that they were dealing with an "active shooter" incident. Peter Vitale is charged with aggravated discharge of a firearm and reckless discharge of a firearm. He turned himself in to police at the Belmont and Western police station Tuesday morning after he received a phone call from an officer who told him that he was wanted in connection with the incident. Prosecutors say Vitale and an unidentified woman went to the roof of the 15-story apartment building at 2738 N. Pine Grove around 2:30PM Sunday. There, a surveillance camera captured footage of Vitale firing a handgun and then giving the weapon to the woman who proceeded to also fire shots. Vitale took back the handgun and fired off more rounds before the two went back inside, a police report says. Vitale is being held in lieu of $150,000 bond.